Review American Airlines baggage allowances and charges before travelling. There is no need to worry about the restrictions of American Airlines' baggage allowance, as you can send as much luggage as you like with Send My Bag. This is a great alternative to dragging your luggage behind you throughout your journey. You also don't have to queue at bag drop or wait around at luggage carousels. Plus, it makes taking public transport before/ after your flight a whole lot easier. Find out how cost effective it is to give yourself a luggage-free journey with a free quote. Economy and higher fares: one carry-on item measuring 22 x 14 x 9 in (56 x 36 x 23 cm), plus a personal item measuring 18 x 14 x 8 in (45 x 35 x 20 cm). Basic Economy: one personal item. There is no specific weight restriction. As of September 5th, 2018, Basic Economy customers will be allowed to bring a carry-on bag into the cabin free of charge, as well as a personal item. In addition to these allowances, items such as medical devices or a nappy bag (for infants travelling with you) can also be carried on board. Passengers traveling with infants may bring on board one diaper bag per child and a soft sided cooler bag for breast milk, in addition to their standard carry-on allowance. Car seats and strollers also don't count towards your carry-on allowance. These can be checked at the gate. You can bring a musical instrument on board provided it fits either in the overhead locker or under the seat in front. If it is too big for this, you can purchase an extra seat for the instrument. The instrument must not weigh more than 165 lbs (75 kg). Pets can be carried on board on certain flights only. The pet in its carrier counts as one American Airlines carry on item. Pets must be placed in a carrier with maximum dimensions of 19 inches long x 13 inches wide x 9 inches high (approx. 48 cm long x 25 cm wide x 22 cm high). Animals must be able to stand up, turn around and lie down in a natural position in the carrier. A fee must be paid for carrying a pet on board, which is currently $125, one way. Arrangements must be made with the airline for the carriage of a pet. On domestic flights, Economy passengers may check baggage up to 62 inches/158 cm in total dimensions and 50 lbs/23 kg in weight. The cost is $30 for the first bag, $40 for the second, $150 for the third and $200 for any additional bags. On transatlantic flights standard Economy passengers are allowed to check one bag at no charge (max. 62 inches/158 cm in total dimensions and 50 lbs/23 kg in weight). Additional bags cost $100 for the first additional bag, and $200 for any further additional bags. American Airlines gives more generous baggage allowances with certain fare types and on certain routes. On qualifying fares/ routes up to three checked bags may be permitted free of charge. Passengers may check in up to 10 bags, depending on the route travelled. First and Business Class passengers (as well as passengers on flights to Brazil) are permitted to check bags weighing up to 70 lbs (32 kg) each. 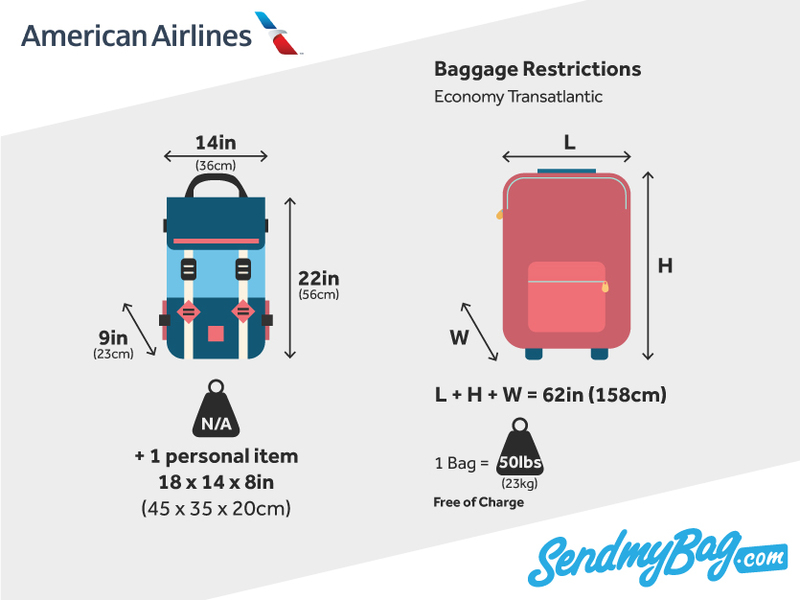 If a bag exceeds the dimensions or weight permitted by American Airlines’ baggage allowances, excess baggage fees will apply. Again, these vary according to the route travelled. There are different charges for overweight and oversized items. For example, if travelling within and between the US, the US Virgin Islands, Puerto Rico and Canada, bags weighing over 50 lbs/23 kg but not more than 70 lbs/ 32 kg will be charged at $100 per piece. Baggage over 70 lbs/ 23 kg but not more than 100 lbs/ 45 kg will be charged at $200. A bag that exceeds 62 inches/ 158 cm in total dimensions will be charged at $200. Most flights do not allow bags weighing more than 100 lbs/ 45 kg. For travel between the US and Europe, bags weighing over 50 lbs/23 kg but not more than 70 lbs/ 32 kg will be charged at $100 per piece. Bags heavier than this will not be accepted on flights to Europe. A bag that exceeds 62 inches/ 158 cm in total dimensions will be charged at $150. Bags with total dimensions of more than 126 inches/ 320 cm will not be accepted. Note that a checking fee, an oversize fee, and an overweight fee could all apply to the same set of checked luggage. You may travel with one golf bag, with up to 14 clubs, 12 golf balls and one pair of shoes. This will count towards one item of checked luggage. A fee of $42.50 is payable on flights to /through/ from Brazil. On most flights a bicycle costs $150 to check. If its dimensions (including container) are less than 62in and under 50lbs, the passenger is charged the applicable first checked bag rate. Bikes must be packaged in a rigid case. The maximum weight allowed is 70 lbs, with maximum dimensions of 126 inches/ 320 cm. Musical instruments may be treated as checked baggage if they are too large to be carried into the cabin, and as long as they do not exceed the acceptable weight and dimension restrictions for checked baggage. American Airlines does not accept responsibility for damages to musical instruments, due to their fragile nature. Pets can be checked into the hold on certain flights only. The charge for a checked pet is $200 or $150 to/ from Brazil. Looking for American Airlines sized hand luggage?